If you're looking for a quiet corner on the coast far from the tourist crowds, this is the place! Vico Equense is the first town along the Sorrentine peninsula, and the perfect destination if you want to explore a coastal town in an area relatively undiscovered by most tourists. 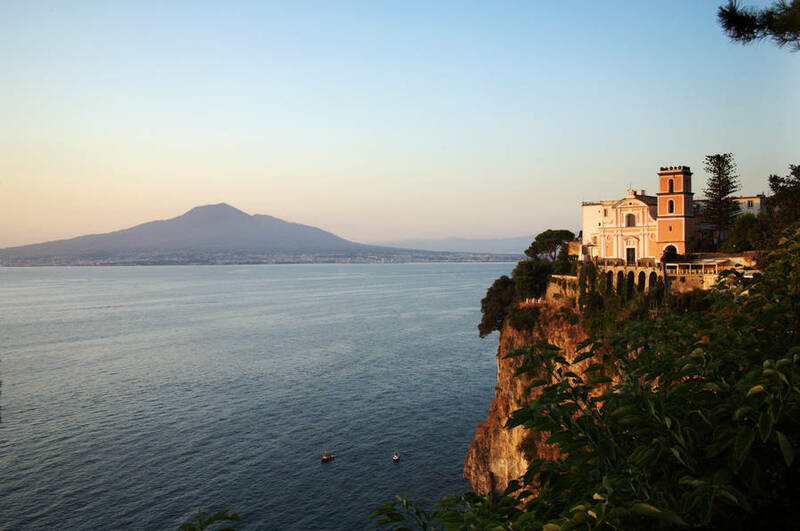 Stay in Vico Equense, where the pretty historic center is set on the clifftop overlooking the water, and there are beautiful beaches and excellent local restaurants, pizzerias, and gelato shops. Less than 10 minutes by train from Sorrento, Vico is conveniently located on the coast yet far from the crowds of international tourists in Sorrento. Outside the town center along the road that climbs the slops of Mount Faito, there are 13 countryside estates where locals head for an memorable pizza or generous farm lunch. If you love nightlife, you can head to Marina di Aequa on warm summer evenings for a bit of a bar crawl or dinner on the water's edge. The most photographed sight in Vico Equense is the pink facade of the former Cathedral of Santa Maria Annnunziata, built on a rocky point directly over the sea. This church is one of the rare examples of Gothic architecture on the Sorrentine Peninsula, though the facade is Baroque. In the small church behind the Cathedral ("chiesa dell’arciconfraternita"), there is a lovely inlaid wooden altar from the 1700s decorated with countless pearls and coral and glass beads created by the cloistered nuns in the nearby Convent of the Santissima Tritinità. The Castello Giusso is also near the cathedral, a Medieval castle commissioned by Charles II of Anjou between 1284 and 1289. Art lovers should take some time to visit the hilltop village of Massaquano outside Vico, famous for its Cappello di Santa Lucia decorated by a fresco cycle from the school of Giotto, dating from the 1300s. La Pizza a Metro: this local version of pizza has a crust that is deeper and softer than its Neapolitan cousin, and is served "by the meter", in large rectangles cut into individual slices. This type of pizza is very popular in the area, and the original version can still be sampled at “Da Gigino Pizza a Metro - L’università della Pizza” in the center of Vico Equense, where pizza by the meter was first invented. Il gelato di Gabriele: this dairy bar makes fresh gelato, cheese, and yogurt...all excellent. You can order a cheese platter to sample a number of different types of their artisan cheese, try a dish of strawberries and fresh cream, or enjoy one of their famous flavours of gelato, best eaten in a warm brioche bun. Gabriele is almost always named in lists of the best gelaterias in Italy. Il provolone del Monaco: this local type of cheese is only made by a few specialized cheesemakers located in the hills surrounding Vico Equense, and exclusively using milk from the heirloom Agerolesi breed of cow. You can sample this cheese at the “De Gennaro” deli on Via Caccioppoli (across from the hospital), or visit a local cheesemaking workshop by car in the village of Pacognano located in the countryside near Vico Equense. Otherwise, order a sample platter of provolone del Monaco at Tavolini della Tradizione, the gourmet shop and bistrot in Seiano run by the De Gennaro family. In addition to their numerous and excellent pizzerias, Vico Equense is famous for having one of the highest concentrations of Michelin-starred and gourmet restaurants in Italy. If you love good food, don't miss Vico's annual festival at the beginning of June! Festivities take over the town center for three days and include dinners prepared by some of the most famous chefs in Italy. Each evening, outdoor kitchens and dining areas are set up along the streets and each chef prepares his or her trademark dish. If you are staying in Vico Equense, make sure to take a day trip to Scrajo, the large thermal baths with curative sulfur water that bubbles up through springs below sea level. Entrance to the spa includes access to the beach and a lounger on the sun deck surrounding the sulfur water pool. You can also reserve a lounger and umbrella on the beach, which includes access to one of the thermal pools. The spa restaurant is also excellent, and mentioned in the Michelin guide. The spa is open from mid-April through October.